The Cyber Warfare Range is a live fire cyber warfare range created to rapidly train/upskill cybersecurity talent with hands-on learning. We also drive innovation in cybersecurity techniques, technologies, and training across the United States and allied countries. The range is a privately funded non-profit entity and is 100% volunteer driven. This ensures that we are completely focused on our missions. Come visit us on-site and take a tour. Also, you can request an account to use the range remotely. For individuals wanting to become more knowledgeable in cybersecurity and InfoSec, we are here to support your efforts with our expertise and resources. We are free and open to the public. Minors are welcome but must be accompanied by a parent or guardian. We are always looking for opportunities to serve the greater community. If you represent a school, business, nonprofit, etc. and have ideas for training or hands-on exercises please contact us. We’ll either help design a training opportunity or connect you with other valley resources that can assist you. 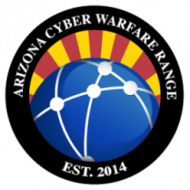 Copyright © 2018-2019 The Arizona Cyber Warfare Range – All rights reserved worldwide.